This crystal chandelier will be a real statement in your home. Its beauty is dued to the craftmanship of the Florence artisans who made it with the top Italian wrought iron and Murano drops. Its splendid birdcage structure is covered with hundreds of Macaroni glass beads. 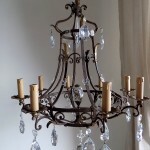 Enjoy this rare antique chandelier from Italy with splendid antique opaline drops.